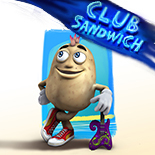 Club Sandwich is about the adventures of a band. Spud and the Taste Buddies are unusual in that they comprise a potato, a beetroot, a strawberry and a Brussels sprout. But thats normal in the town of Yum, because nearly everyone else here is a fruit or a vegetable too. The Taste Buddies are dedicated to their art. Their mission in life is to create, play and learn about music. And theres no better place to do this than Yum, because at the heart of the town is the legendary Club Sandwich, a spectacular funhouse where the band regularly plays. The citizens of Yum love Spud and his friends, and its not just for their music. Spud is a potato with a love of adventure and a heart of gold, who never says no to someone with a problem. Thanks to Spud, the Taste Buddies are constantly embroiled in the affairs of the town, solving mysteries and springing into action when things go wrong. This is especially likely when Supersize is around. He one of the few characters who is not a fruit or a vegetable. Hes a big lazy burger and a bungling show-off who wants to be cool and admired without making too much effort. Whether theyre fixing things that Supersize has made a mess of, or solving other problems around Yum, Spud and the band use music whenever they can to put things right. Music is their first love - it makes the world a better place, and theyre the living proof of that!